That time where the craziness of the holidays can push us over the edge, because we all think there is “so much to do and so little time”. I’ve also noticed, in all of the conversations I’ve had with colleagues and friends alike, it really doesn’t matter what holiday you are celebrating. It all seems to create stress for everyone. Much of the stress comes from the onslaught of images that flood everyone’s social media feeds…it always seems that everyone has their life together except for you. But, that’s not necessarily true. It’s just that many companies and food/lifestyle professionals want to show their audience the most perfectly crafted scenes. The unfortunate thing is we (their audience) get overwhelmed because it just seems like it is so much work to re-create that perfect setting. According to a recent survey by President’s Choice®, more than two-thirds (67%) of Canadians want to show their love towards family and friends by putting a lot of effort in the kitchen over the holidays. But, all of that effort is making many of us really tired – 51% of Canadians feel that holiday prep leaves them feeling exhausted. So, today, I’ve partnered with President’s Choice® to bring back the magic of the holiday season by showing you some shortcuts to host your very own holiday cookie exchange and still have time to join in on the festivities!! Ask your friends what they plan to bake to avoid duplicates and ask them to bring 6-12 cookies multiplied by the number of guests so each person gets to take at least 6 of each kind of cookie home! You don’t want to stress them out, so you can let them know that simple is the best! Decide on your party food…and if you feel overwhelmed, there is no shame in asking for the food to be pot-luck. Bake your cookies and store them in an airtight container or freeze them. When I’m hosting a cookie exchange, I like to focus on the treats I’m serving that day so, oftentimes, I will make “slice-and-bake” cookies like these below so each person gets a log to take home and slice and bake at their leisure. This way, I can make them weeks in advance and freeze them for the special day! Begin decorating the house if you are planning on going all out (this isn’t necessary if you have a lot on your plate). Look at your tableware to make sure you have tablecloths, napkins and cutlery (again, this doesn’t have to be anything special…you’d be surprised how beautiful disposable entertaining supplies are!). Have some Christmas music ready – whether it is you own playlist, a playlist from Spotify or even an old-fashioned holiday CD! Write out a rough schedule for the party (this should take you 10 minutes!). This is just to ensure that everyone has time to socialize – including you – but still have lots of time to eat and pack up their cookies! Set your table! If you have a large one, you can have savory snacks at one end and the cookie exchange cookies at the other. Or you can use two smaller tables (or your kitchen island if you have one). Either way, set you table with the platters and trays out so the execution is fool proof on the day of the party! If you have cake stands or other tiered serving trays, use them, since dishes at different heights add visual drama!! If you are serving a cocktail (I think this is always a fun idea – even if it’s non-alcoholic), try to serve one that can be made in a batch (like a holiday sangria). Make most of it the night before and just add the bubbly when guests arrive! Arrange the food and drinks on your platters/tables. Fix up or add any last minute decorations. Brew the coffee (and tea), pull out your party timeline, put on a festive sweater, crank up the music and get ready to party!! So now that you have a timeline, let me fill in all the blanks! The awesome people over at President’s Choice® sent over a box of goodies to help me put on a quick cookie exchange (and by quick, I mean, I pulled it off in 4 days…from invite to celebration!). They also sent me some really interesting statistics when it comes to holiday entertaining – some of which I spoke about at the beginning of this post. But, one of the points that stuck out to me was that 72% of Canadians want to prepare a meal that will create amazing holiday memories for family and friends but they also don’t want to miss out on the fun themselves. So with that in mind, I’ve created a fairly simple plan to invite your best buds over and have some COOKIES (as well as other yummy tidbits!!). I had already decided, because I was short on time, I was going to give away frozen sugar cookie rolls (like I showed you above) so I could focus on the treats that everyone was going to share on the day of the exchange. 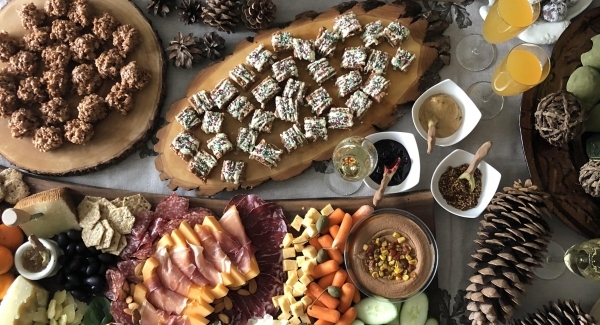 My plan was to create a fabulous charcuterie board – because it can’t always be about sugar – and another sweet dessert board! You’re going to love this!! First off…the charcuterie board! I mean, how pretty does this look?? And if you think you can’t do this, remember, imitation is the best form of flattery…just copy mine! In my box of goodies, was PC® Black Bean Hummus and this salami trio below…both were the perfect beginnings of a wonderful savoury board! Plus, they are both good things to have on hand because they are vacuum sealed for freshness and can be kept in your refrigerator for weeks! I wrapped some prosciutto around some melon, added some carrots and cucumbers, some different cheeses that I had in my fridge (hint: always keep blocks of different vacuum packed cheeses for last minute guests – they keep for months! ), some crackers, a ball of buffalo mozzarella (it’s kept under water so it also keeps for a few weeks), and then for visual interest, I added some caper berries (they are large stemmed capers that are yummy to eat and keep well in the fridge), a block of honeycomb for your guests to drizzle on the cheese (again, keeps forever in your pantry! ), black olives (again, in a jar, they keep for a long time) and a scattering of almonds and walnuts. I always add some jams, mustards and honeys to my boards (in little bowls off to the side)…it just keeps the variety of each bite different!! I mean, it’s easy peasy!! Next up, the sweet dessert board! These incredible PC® Toffee Hazelnuts coated in milk chocolate! Seriously like kryptonite!! And if chocolate and coconut are your thing, this PC® Milk Chocolate with Toasted Coconut bar will make you giddy!! I put 4 bowls on a long board and filled two of them with the toffee hazelnuts and, in the other two, I put salty treats (fried chow mein noodles and salted pretzels). I also made a sweet dip for the salty treats (basically, a package of cream cheese mixed with brown sugar and cinnamon, rolled in chocolate sprinkles and placed on the board). In the spaces that were left over, I filled them with a variety of the biscuits and the chopped coconut chocolate. Come on, right? How easy is that?!?!? The other treats you see on the two trays below are one recipe made two ways – reindeer drops!! You can find the recipe here. As a quick snack, I ran them under cold water (because I didn’t want to boil them but they were frozen) and placed them on a piece of phyllo I happened to have in the fridge (I was using it for another recipe – you could totally use crescent roll dough or even store bought pizza dough! ), sprayed with cooking spray, sprinkled it with salt and pepper and a few sesame seeds. Honestly, a fast, crunchy and pretty healthy treat!! You can serve them in a large glass jar (I re-purposed a short vase!) that is filled with pistachios…they will hold up the spears and people can eat them too!! I quickly boiled them for a few minutes, then toasted them in some hot olive oil. Once they were done, I skewered them with a hunk of parmigiano reggiano and gave it a drizzle of honey and a good pinch of pepper…heaven on a stick!! So there are two perfect snacks for your guests that take no time and look really cute on a platter! Now, let’s say you don’t want to make the chocolate/sweet board but would rather make some additional sweet treats for your guests – but don’t really have time to bake? No problemo!! I had made some cake pops and had them in the freezer but you could use store bought chocolate donut holes or even store-bought truffles. Put them on a platter and dust them with icing sugar…you have instant “snowballs”. Clever, right? Want another clever quick treat? Buy a jar of this new PC® Crunchy Chocolate Hazelnut Spread and slather it between two store bought cookies (I used amaretti cookies…I think that was a brilliant choice!!). Look how pretty they look with some of the slice and bake cookies I baked!! Keep your guests hydrated with coffee and tea (obviously) but also water, perhaps wine and, for the purists, cold milk!! Cool treats completely before packing…that way crisp cookies stay crisp! Always separate soft/chewy cookies from crispy cookies! Most cookies keep at room temperature (sealed) for a week or so and keep frozen for a few months. Make sure to tell people to bring their recipes printed out so you can hand them out to everyone. Also, tell your guests to note any allergens (nuts, gluten) for those who need to know. So, there you have it…all the steps you need to plan an awesome cookie exchange – minus most of the stress. And if you’d like an amazing recipe for two toned chocolate coconut cookies – basically a fancy version of slice and bake cookies – here is a recipe that can easily be made ahead (you can see them on the plate below). Line bottom of 8" (2L) pan with parchment paper, leaving 1" overhang on two opposite sides. Set aside. Beat butter with sugar in a large bowl using electric hand mixer until fluffy. Beat in egg, scraping down side of bowl. Set aside. Whisk flour with baking soda in a separate large bowl. Stir half of flour mixture into butter mixture just until combined. Stir in remaining flour mixture and chocolate until just combined. Remove half the dough to a separate large bowl; stir in cocoa powder. Press cocoa dough evenly into bottom of prepared baking dish; press white dough evenly over top. Refrigerate 15 minutes. Lifting with parchment paper, remove dough from baking dish and transfer to work surface. Cut dough in half; invert 1 piece over the other piece so that both white strips are in the center of stack (you should have 2 thin strips of chocolate dough with 1 wide white strip in between). Press gently to adhere. Wrap in plastic and refrigerate for two hours or up to 24 hours. Preheat oven to 325F. Cut dough in half lengthwise to make two 2" wide logs. Cut each log crosswise into 1/4" thick slices. Arrange, 1/2" apart, on PC® Non-Stick Carbon Steel Textured Cookie Sheets or parchment lined baking sheets. Bake 1 sheet at a time, until pale golden and tops are no longer shiny, 12-14 minutes. Let cool completely on sheets.